It’s time for another delicious cast iron skillet recipe! 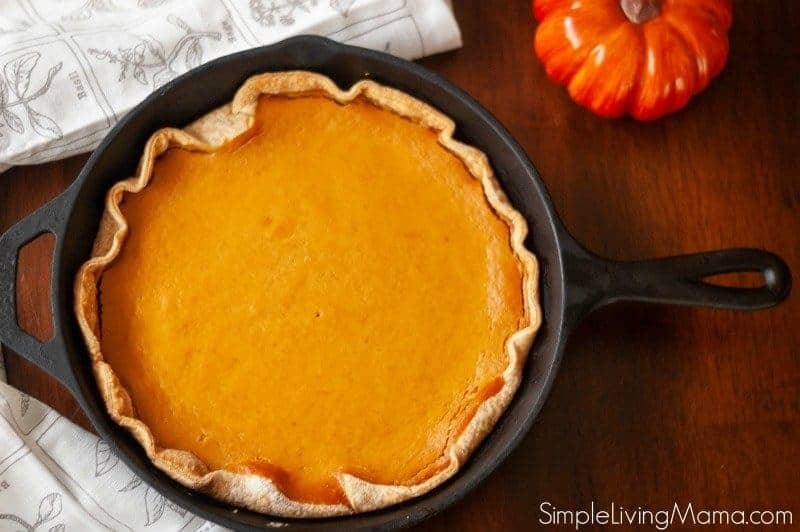 Today we are going to make my cast iron skillet pumpkin pie. I’m pretty sure nothing says fall more than pumpkin. 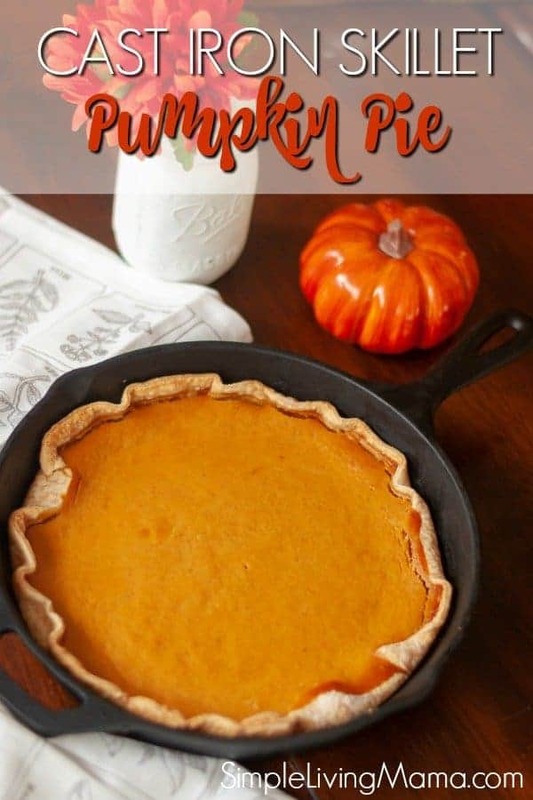 I love all kinds of pumpkin recipes, but it was only recently that I developed a taste for pumpkin pie. 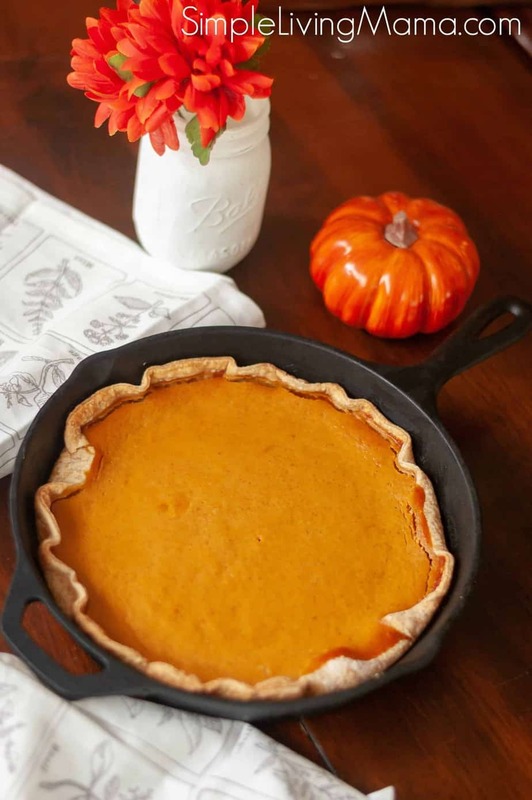 This is the first year that I’m pulling Thanksgiving off on my own, so I’m very excited to add this delicious cast iron skillet recipe to our table! 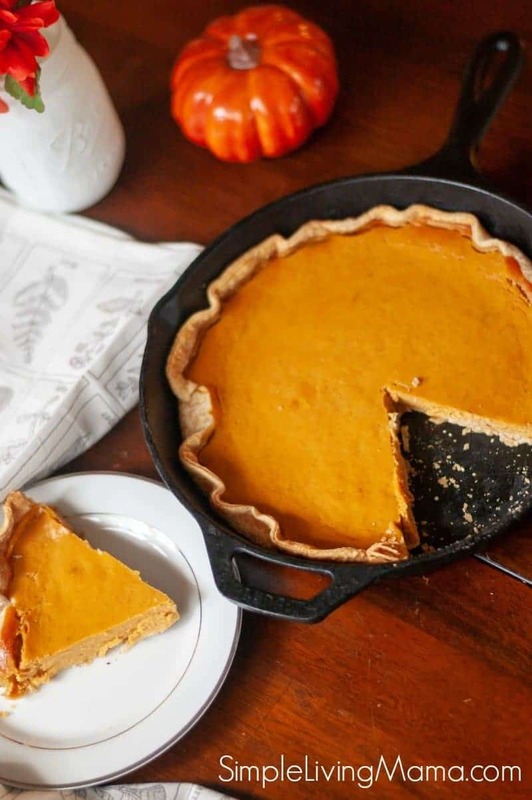 Yes, you can bake a pie in your cast iron skillet. Just like I showed you with my apple crisp recipe, a pie can easily be made in your skillet. 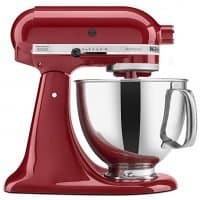 It’s warm, comforting, and a little bit rustic to put together your pie and cook it in the ultimate multi-tasking piece of kitchen equipment. I’m using my Lodge 10 inch cast iron skillet for this pie. I warmed my skillet on the stovetop and then melted some butter in it to grease the pan before I put the crust down. I’m taking a shortcut and using a pre-made crust. 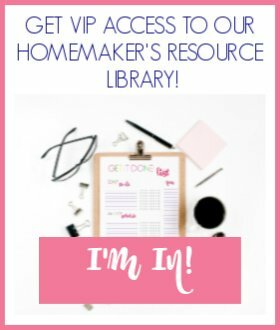 Nothing is easier, right? If you like to make your own homemade pie crust, you certainly can. Let’s talk a little bit about what actually goes into the pie filling. 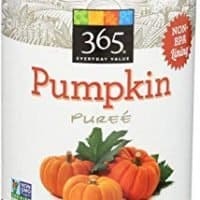 Make sure you purchase pumpkin puree, not pumpkin pie filling. I like to keep the spices simple with sugar, cinnamon, nutmeg, and ginger. You could also use cloves if you’d like. I add a pinch of salt and a can of evaporated milk and whip it all together and the pie filling is ready to go! 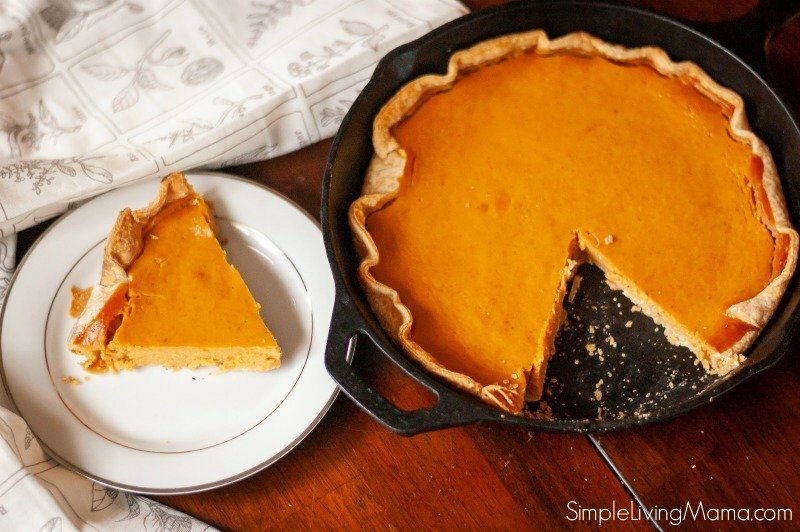 The secret to the perfect pumpkin pie is in the baking method. Preheat the oven to 425 degrees Fahrenheit, and bake the pie for 15 minutes. Turn the heat down to 350 and continue baking another 40 minutes and the pie will turn out perfect. 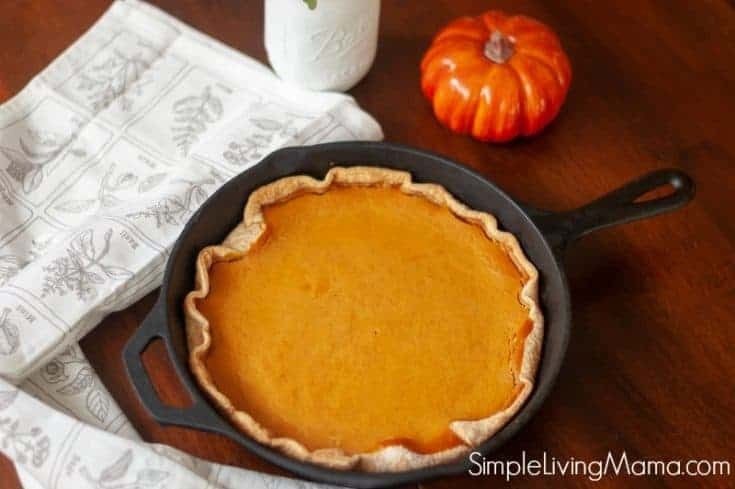 Serve this skillet pumpkin pie with some homemade whipped cream and enjoy with a big glass of milk after your Thanksgiving dinner. Eat the leftovers for breakfast! I won’t tell! Are you planning your Thanksgiving dinner? 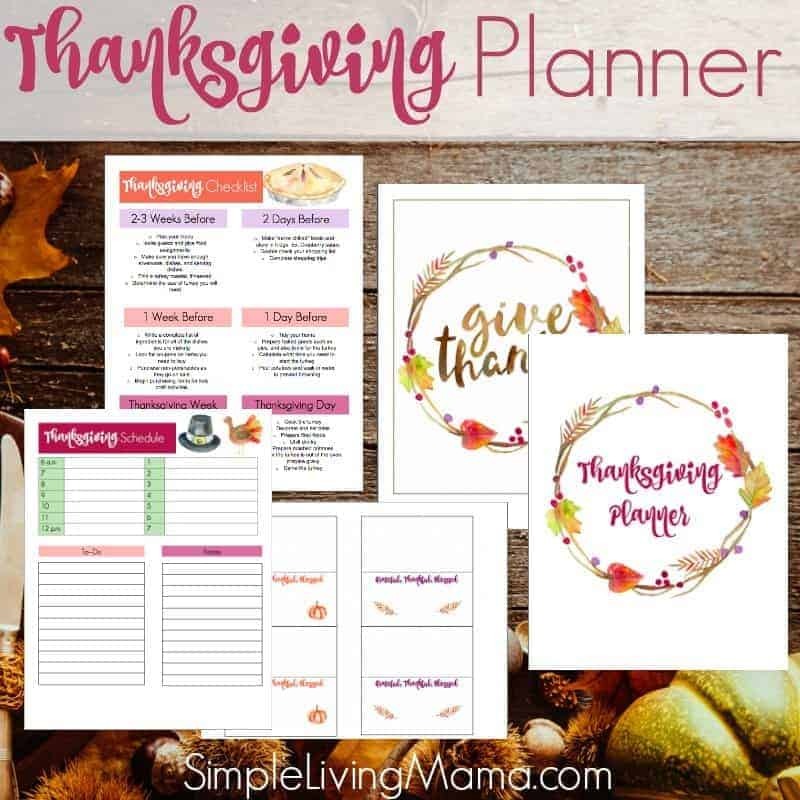 Our Thanksgiving planner printables are a simple, yet beautiful way to track everything from guests to groceries! A delicious and creamy pumpkin pie recipe made in a cast iron skillet. Mix sugar, cinnamon, salt, ginger, and nutmeg in a small bowl. In a stand mixer, beat eggs. Add in sugar and spice mixture. 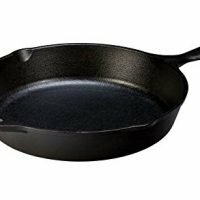 Lightly grease a 10 inch cast iron skillet. Turn oven down to 325 degrees and bake an additional 40 minutes until a toothpick inserted comes out clean.